WITH an entire city centre awarded UNESCO World Heritage status, architecture dating back further than the 12th century, a wealth of history and a gateway to the spectacular Duoro wine region, Porto is a city that should be more well-known. Yet despite being the second largest city in Portugal and one of the “big five” of the Iberian Peninsula, there’s a strange sense that visiting Porto is a discovery of the unknown; as if you’re amongst the first tourists setting foot on its ancient streets. It doesn’t have the feel of a city that exists only for tourism, nor seeks it; instead just getting on with life, quietly minding its own business. There are some areas which can get busy, as well as others – most notably on the Ribeira – that can be categorised as a “tourist trap”, but it’s unlikely that there’ll be large crowds of visitors around every corner as there would be in many of Europe’s more popular destinations. Situated on the Atlantic coast, around half way up the west of Portugal, Porto experiences a much milder climate than that of southerly resorts in the Algarve. This is a definite help when exploring the city’s centre on foot, as is the best way to get to know Porto. And with visitors led up and down the steep gradients that are a common characteristic of the city’s streets, persistently hot temperatures would be far from ideal. The most photographed views inevitably involve the iconic Ponte Luis I bridge, which operates on two levels (trams run along the top, with a road underneath). The bridge dominates the landscape around the Ribeira district – either in the background, whilst wandering along the riverfront; or immediately below, when observing panoramic views of the city from the excellent vantage point of the monastery, positioned high above the bridge on the opposite side of the river. But the real sights though are in the detail of so many of the buildings, each with their own unique appearance – and colour. Blue and white tiled facades are one design feature that is common to see, especially on some of the city’s churches, though there’s no repetition in the actual imagery of the tiles. Walk around Porto without taking notice of the infinite uniqueness of almost every piece of architecture and it’s possible to miss so much of the city’s character. On the other hand, to consciously acknowledge every ounce of quirkiness will lead to very slow progress. But in a city that is compact enough to become familiar with after only a day or two spent wandering, that’s ok. Among the architectural highlights which deserve singling out are Sao Bento station, Se Catedral, the origins of which date back to the 12th century, and the Clerigos tower, which provides panoramic views over the city below. Three or four full days is a sufficient amount of time to to get a good sense of Porto’s appeal. 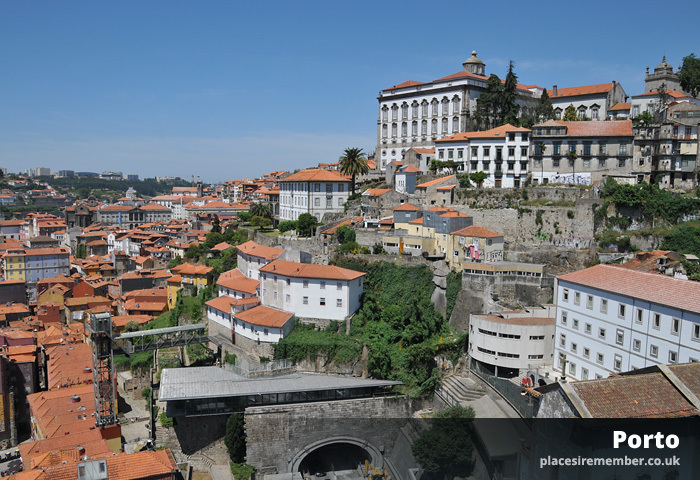 However, it’s also well-located for excursions to historic Guimaeres, the former Portuguese capital, and as a starting point for venturing deeper into the Duoro wine region. Fittingly given the 2014 award for the best destination to visit by the travel group European Best Destinations, a body almost as low profile as the winning city itself, Porto shows no sign of selling out to mass tourism, or abandoning the quiet profile that it enjoys; an endearing factor in a place where future visitors can join those who have come before in the discovery of such an fascinating city.